The ingredient Imp Gall is primarily collected from dead Imps. Imp Gall is one of only two ingredients (the other is Troll Fat) which can be used to create Fortify Personality potions. Since these two ingredients also share the effect Damage Health once you reach Expert alchemy level, expert alchemists can only make Fortify Personality potions that have a negative side-effect; only apprentice and journeymen can combine these ingredients to make a Fortify Personality potion without side effects. Master alchemists also have the option of making a Fortify Personality potion from Imp Gall by itself, without any side effects. Imp Gall is also one of only three ingredients which can be used to create a Cure Paralysis potion. At journeyman level it can be combined with Milk Thistle Seeds; at expert level Viper's Bugloss Leaves also become available. There are no negative side effects from combining any of these three ingredients. During the Fighters Guild quest More Unfinished Business you are asked to obtain 10 samples of Imp Gall and deliver them to Aryarie. It can also be found randomly in the inventories of alchemy vendors (starting at level 1) and in some Monster loot chests (starting at level 3). Imp Gall is collected from dead Imps, including Sparky and Frostcrag Spire's Vault Guardians. 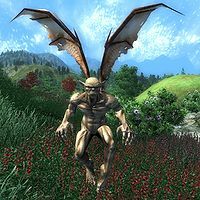 Imps are most frequently encountered as randomly generated Monsters. They are low-level creatures and therefore they are easy to find early in the game, but become fairly rare at high levels. In Monster Dungeons (circles on map), they are normally found from levels 1 to 10 (except when generated by mixed animal/monster lists, in which case they are found from levels 5 to 15). Outdoors (squares on map), they are found in every terrain except Farms and Plains. In the wilderness they appear starting at level 3 and can be found up to level 11-14 in most areas; along roads, they only appear in Hills and Valley terrains, starting at level 1. 12 respawning Imps always appear in Robber's Glen Cave (red circle; at low levels the boss-level creature may also be an Imp). 4 respawning Imps always appear in Sideways Cave (red circle; at low levels 11 are likely). If you have purchased the Wizard's Tower official plug-in, there are 7 respawning Vault Guardians in the vault. Sparky in the Anvil Mages Guild (magenta circle) exists at all levels, but Sparky does not respawn. 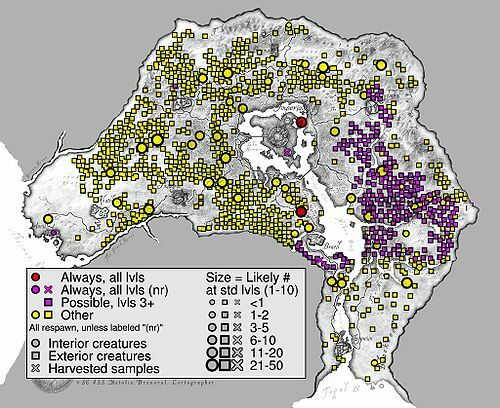 Outdoors in Valley regions only (purple squares), there is a chance of encountering an Imp at all levels above level 2. Esta página foi modificada pela última vez à(s) 20h01min de 29 de abril de 2014.